A myelogram is a minimally invasive procedure which visualizes the spinal canal. This procedure complements MRI imaging of the spine. 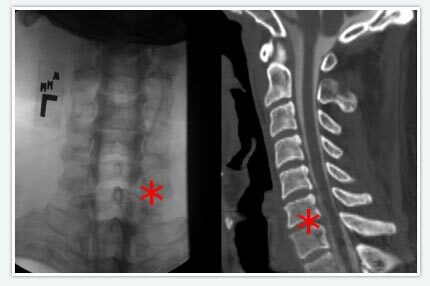 Myelography is particularly sensitive at detecting small disk herniations compressing nerves of the spine. This test is often ordered by surgeons for operative planning. It is also used as a substitute for MRI imaging for patients who cannot have an MRI. A myelogram is an outpatient test. After signing a consent form, a patient lays on his or her stomach on an X-ray table. The skin of the low back is numbed with local anesthetic and a needle is lowered between the vertebra of the back to the spinal canal. A small amount of contrast (X-ray dye) is injected. Standard X-ray images and CT images are then obtained. The CT images are reviewed by a radiologist and a report is usually available to the requesting doctor within 24 hours. Patients having a myelogram must bring previous back scans and X-rays to permit planning of the procedure. Patients recover at Saint Luke's Hospital 4 hours after the myelogram is complete. Note: patients with a history of severe iodine contrast allergy may not be able to safely undergo a myelogram. CT myelogram images of the lumbar spine. 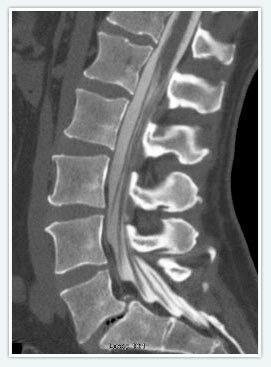 of the cervical spine demonstrating a disk herniation(*). We are located at Saint Luke's Hospital of Kansas City, on the Country Club Plaza. Appointments are made by Jessica Kelsey, RN. She may be reached by telephone Monday through Friday 8 to 5 at (816) 932-2549. New patients should be referred by their primary care physician, neurologist, ophthalmologist or neurosurgeon. On the first visit, patients should be prepared to bring medical records, a referral letter, and X-rays and scans. Records and correspondence may be faxed to (816) 932-5753. Disclaimer: This web site is for educational purposes only. It is in no way intended to offer medical advice or replace a face to face visit with a physician. Site design by Rhombus Design.